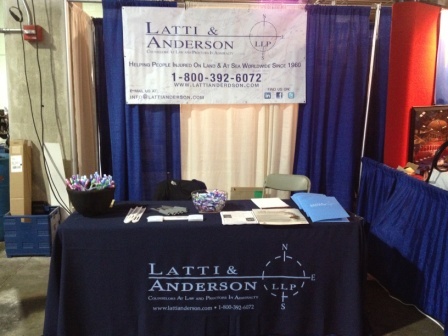 On April 27th through the 28th, Latti & Anderson LLP will be attending the Commercial Marine Expo (CME) in New Bedford, Massachusetts and we would like you to join! You can pay $20 at the door upon arrival. However, if you contact our office at (800) 392-6072 or contact us online, we can send you an invitation that will allow you to attend the Commercial Marine Expo for free! If you make a living on the waterfront, this expo is where you need to be. The 2016 CME is going to be the biggest expo yet and will have more exhibitors with the latest maritime gear and information than ever before. Stop By Our Booth at the Commercial Marine Expo! The expo is located at the State Pier and our maritime injury attorneys, Carolyn Latti and David Anderson will be at our booth, ready to talk to you about our maritime injury legal services. Our firm represents people with injuries they sustain either on land or at sea, nationwide. We have decades of experience interpreting what your rights are according to maintenance and cure, The Jones Act, the Longshore Act and will explore all options to make sure our clients can receive the most compensation for their injuries. Previous Is Too Much Technology Causing Maritime Accidents? Next How Did This Worker Sustain Amputation Injuries While Channel Dredging?